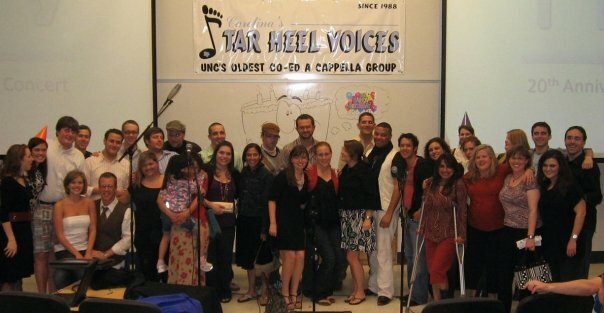 Tar Heel Voices is 25 years old. Return to Chapel Hill April 11-13 to celebrate 25 years of music and friendship. Relive Chapel Hill in the springtime, visit with old friends and sing “American Tune” (or “Hark the Sound”) with us. On Friday night, we’ll head to Franklin Street for an informal gathering at Back Bar, the new(ish) Top of the Hill-owned bar. On Saturday, join us for a catered lunch on campus. Family and friends are welcome — this event will serve as a great time for kids and spouses to meet, plus the Spring Football Game is right after it at Kenan Stadium. On Saturday night, we’ll attend the 25th anniversary concert to hear some great a cappella and be the loudest, rowdiest bunch of alumni ever. The after-party at Linda’s is sure to last into the wee hours of the morning… for those of us who can still stay up that late. On Sunday — to conclude the anniversary weekend — we’ll hold a brunch (not too early) for one last chance to hang out before we say goodbye, at R&R Grill. Don’t miss your opportunity to see old friends and celebrate the group that changed your college experience. We look forward to seeing you this April.